"Our salesperson, John Cox, was an absolute pleasure to deal with. From the test drive Mazda experience to getting us the colour of SUV we wanted and everything in between, we couldn’t have asked for a better experience. We had shopped around at many dealerships (including other Mazda dealerships) and had the opportunity to compare many facets of the car buying experience. 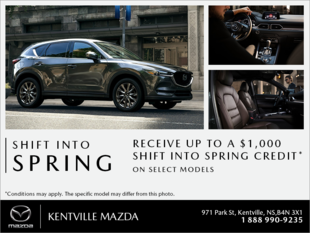 Without a doubt, Kentville Mazda was the obvious winner. Every aspect of their car buying experience was seamless. The only drawback we found was that they were 100 km away from where we live, but they were worth every km of that commute. I would highly recommend Kentville Mazda to all of my family and friends!"